The Facebook™ Side Hustle Course Is Coming January 2018! The course is currently open for enrollment. If you've been thinking about making extra money to pay off debt or invest a little more every month, the FB Side Hustle Course is definitely for you. I've honestly been a little shocked by the response to the idea of this course, so I wanted to take some time on the site to detail what I'm planning, why I'm incredibly excited about it, and how it all came together. In just the few social media updates I've done, over 1,000 people have shown extreme interest in this thing. I think it's going to be a game changer for my normal readers that want to make $1,000+ extra on the side in their spare time. Yes, I said $1,000 extra per month. Yes, I'm being realistic. Keep reading and I'll explain. So earlier in the year, I set out to create a course called the Make Money Marketing Course, which is exclusively for bloggers. As many of you know, I had to start a small digital marketing agency when I quit my teaching job to run M$M full-time. That turned into a $50,000+ per year side hustle that I ran while I grew M$M to a $100,000+ per year blog. Initially, it was going to be this monster course that would teach bloggers everything they could possibly learn about marketing for local businesses. But, as I got into the course and started consulting with some course making pros that I'm friends with…I realized I was going about it all wrong. In the process of trying to pack everything I knew into the M$M course, I made it too bloated, too long, and massively unfocused. That's pretty much everything that goes against what I learned while getting my education degree and being a teacher. In my first attempt, I basically created a course that wouldn't actually lead to success for bloggers. So I reverse engineered the M$M course, took it back to the basics, and streamlined it to include the first services that I ever provided for clients when I was still new to marketing. Now the course is designed to give bloggers quick wins with a marketing side hustle, and a real way to earn legitimate money with their blogging skills. In the *new* M$M course, I'm teaching bloggers how to run local Search Engine Optimization for small businesses, manage local social media accounts, and write freelance content geared towards small businesses. It also covers client acquisition strategies, dealing with clients, and the ins and outs of running a small marketing operation (invoicing, taxes, etc.). I'm way proud of how it turned out, and I feel like it will lead to much more success (aka actually making money and not getting fired by clients) than my original course structure. As per the advice of my accountant (new potential tax changes and such), this course will drop in January. I'll be looking for beta testers here in the next week, so be on the lookout for an email from me if you're already on the waiting list (you can go here to jump on if you're not already on it). Cool…so where does the Facebook™ Side Hustle Course come in here? So as I was streamlining the M$M course, I basically ran into the perfect storm. I was doing a consulting call with a good friend of mine named Mike Yanda, who runs a very successful Facebook ad agency. After high school, we went our separate ways. I became a band director, and he became a lawyer. So we were talking about my marketing course, what he thought I should include about Facebook to help my students, etc. During that process, he floated an idea about how it would be kinda cool to co-create a Facebook course someday for normal people as a way for them to make extra money. As soon as the words came out of his mouth, I knew it would be an absolute home run. I know my audience deeply. I spend more time than almost any blogger I know interacting personally with the people that come to my site. 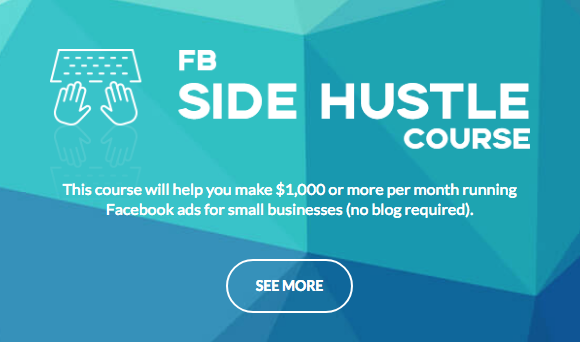 What is the Facebook™ Side Hustle Course going to teach me how to do? The course will be designed to teach normal people how to run Facebook ads for businesses/clients and generate leads for them in your spare time. Think CrossFit gyms, local restaurants, etc. As digital marketers, Mike and I both know that the demand is crazy for this right now and will continue for years as Facebook advertising continues to explode. Is the F$H Course for bloggers or normal M$M readers? The course is designed for normal people. You do NOT have to be a blogger to take this course. In fact, all you need to know how to do is use Facebook like you already do. Both Mike and I had zero experience with Facebook ads before we started providing the service for clients. How much time will this side hustle take every week? Setting up Facebook ads typically takes a few hours to set up per client initially, and then they essentially run on autopilot for the life of the campaign. It's industry standard to charge a client $1,000 – $2,000 per month to run Facebook ads for them. Our goal is to teach people how to get a few clients that they can manage in their spare time. If you get into it, love it, and want to scale up to try to make it a full-time gig – we will provide courses down the road for that as well. Will you teach me how to get clients? Yes. A major component of the course will be different client acquisition strategies that Mike and I have used over the past few years. I was a band director with zero sales experience, and he was a lawyer with zero sales experience. I feel like we have a unique perspective on having success with getting clients. Right now we are fairly settled on $247. The reasoning behind this price point is actually pretty cool. Facebook marketers typically charge $1,000+ for courses like this. But in my opinion, that's unreasonable for people like my readers that are really trying to get ahead financially. Here's the thing – I have something that none of these Facebook marketers have. A large audience. I can price this course at a quarter what everyone else can, and just straight-up do more volume than anyone else. It allows me to give a high-level training to a lot of my readers at a reasonable price, which is freaking awesome. The other thing I have on my side is trust. A lot of these internet marketers have no credibility and have to use tons of sales tactics to get people to make an emotional decision and buy their course. I've gotten to know my readers. I know most of you need a real way to make extra money. I've also been on CNBC, Business Insider, Forbes, Marketwatch, Reuters, etc. You don't have to go far to know I'm a legit person and have a real track record. What if I have technical issues or need help after I take the course? We are going to create an optional support group where students can ask questions, and also get some further education. Have problems with your ads? Cool, we'll help. Want to get some tips on getting clients? Cool, we'll help with that too. The first month of the support feature will be free, and then we will charge a super reasonable monthly amount afterward if you like having the safety net. This will definitely be a new chapter in my business, but I think it's going to be awesome. I've been able to help tens of thousands of people get better at personal finance, and now I'm going to take the skills I've picked up from running an online business to help everyday people make more money to pay off debt or invest. Right now, we're looking at launching somewhere between January 15th and the 20th of 2018. If you are fired up about the F$H Course and want to start making money from a legit online side hustle, head over to the course information page to learn more! I'm sure you probably still have more questions about this course! Feel free to ask in the comments below. I’m excited for this! How many hours would you guess you’ve put into producing this – just out of my own curiosity?? Honestly no idea haha. This whole course process has taken a looooong time, but I wanted to get it right before releasing. Light at the end of the tunnel finally haha. Will F$H contain content on the technical details such as FB Pixels and implementing Website analysis on how many views are from FB, etc.? It will have an entire module on the Facebook pixel and tracking leads. We won’t be sending views to a website though. We’ll be creating specific landing pages and tracking the metrics there. Thanks. Based on that answer you got a new student when course comes out! Really excited about this course! What a great idea, I’ve been looking for the right side hustle. This looks perfect for me! No, the Marketing Course and the Facebook course have no overlap, other than maybe some of the sales strategies. I’ll be putting more info out on each one over the next few weeks, and will include the course content. Hope that helps! That does help some. I’ll keep checking back for more info. Thanks! I’m not particularly “Tech Savvy” Does the FB side hustle require that? Also, I live way out in the country. Can it be done on cellular signal? My business partner on this (Mike) is terrible at tech stuff and works from his in-laws home in the hill country on a cell hotspot all the time. The way we are doing this course is basically an “over the shoulder” walkthrough. We will literally tell you what buttons to press in the Facebook business manager to make all of this work. No website skills required. Hi! I had a question. I’ve been reading your blog on and off for a bit now. I think there has been a lot of good information that has helped me. I’m always looking for ways to get ahead as I have a family of six. With as many people who are going to be jumping into this though, I was wondering if you think there might be a glut of workers in this area. Or is there really this much demand in this area? Great question! The reality is that there are 27.9 million small businesses in America. Even if we were to have 1,000 students take the course, it’s a drop in the bucket compared to the number of small businesses that are going to be jumping on the FB ad platform in the coming years. We’ll be focusing on local businesses in this course (because honestly, it’s fairly easy to get local clients), but there is opportunity for international clients as well. I’m intrigued, as a web developer I think the bigger value I could add to any freelance clients would be marketing/sales, over just building a site itself. That said, I have never had a freelance side-hustle. I haven’t found interested clients, and even if I did, I’d be nervous about the “business side” of working with them — contracts? payment collection? setting up a business the right way so i don’t end up in legal trouble? Interested in the content of the course, hope it can help me with some of my additional questions. I applied for the Facebook course couple of weeks back and I received a message “Success! Now check your email to confirm your subscription.” Unfortunately, I did not get any email to confirm. I did check my spam and junk folder…. Anything I need to do to be part of the waitlist? Hey Mathew – I recently changed up some things with my email opt-ins. I’ll make sure you’re on the list! I’m considering using FB ads to promote my affliate posts. Would this course help? So basically just driving traffic to posts with affiliate links? Yes it would definitely help, but I will say that it’s not necessarily the end goal of the course. The biggest difference would be the audience targeting and you wouldn’t need a funnel/lead form that the last module or two will teach. How many hours do you typically spend per week or month on 1 client? Do you mainly work from your home computer? Is there any initial investment other than the cost of the course? This is a great, interesting side hustle and I would like to know these things before committing to paying for the course. 1. Initial onboarding for a client (which includes setting up their account, creating target audiences, and the ads) takes 3-4 hours. After that, it’s really just 1-2 hours per week depending on the client for small tweaks to the ads for performance. The nice thing about Facebook ads is that they essentially run themselves until the campaign ends. 2. No, there is no additional investment required to get started. I was wondering if you know when the course will re-open again? Thanks! Mid-March! If you’re on the waiting list you’ll get an update.